Zack Brown – RHP – Kentucky. 6’2″ 200. Class: Junior. DOB: December 15, 1994. Last Drafted: 2013 (Chicago Cubs- 38th Round). Vanderbilt Commodores @ Kentucky Wildcats, May 1, 2015. Lexington, Kentucky. Florida Gators @ Kentucky Wildcats, March 25, 2016. Lexington, Kentucky. Baseball America ranked Zack Brown as the 385th best prospect in the 2013 draft out of Seymour (Ind.) High School. Brown slid to the Cubs in the 38th round, due in in part because of his strong college commitment to Kentucky. As expected, the Cubs were unable to sign Brown as he ended up in Lexington. After an up and down freshman season in which he made 19 appearances and 5 starts, Brown stepped into the Friday role as a sophomore. Anchoring a weekend staff that included 2nd round pick Kyle Cody (Twins) and 32nd round pick Dustin Beggs (Mets), Brown led the team in ERA at 3.48. After pitching his sophomore season with an injury in his non-throwing arm, Brown didn’t play at all last summer. 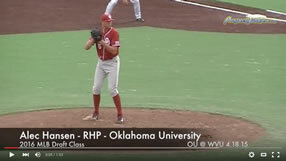 Brown entered the season ranked as the 40th best college draft prospect by D1Baseball, and 35th by Baseball America. Brown got off to a rough start in 2016, stringing together several disappointing appearances to open the season including a 3.2 inning, 4 hit, 5 run, 6 walk appearance against Florida. Pitching better of late, Brown could regain some of luster he lost with a strong finish. *As of June 7, 2016. Fastball: I don’t see a lot of projection left for Brown. Consistent in his front knee action by sticking his landing each time and locking his knee, Brown may have reached his terminal velocity. Sitting at 91-93 mph with good sink, this has the makings of an above average pitch when located. Curveball: Brown’s curveball is thrown between 78-81 mph with a sharp 11-5 break. Brown has shown the ability to use this as a “get me over” offering early in counts, and to bury it for a punch out when needed. Changeup: Used sparingly in the two outings in which I saw Brown, this pitch was 82-83 mph with occasional fade. Delivery: Coming almost completely over the top, Brown gets the most out of his modest 6’2″ frame. There is some effort in the delivery and the while the aforementioned exaggerated knee lock maximizes Brown’s velocity, it sometimes impairs his ability to finish. Control/Command: Brown’s issue has been more of a lack of command than one of control. Brown’s control has been consistent sitting at around 3.5 per 9 in each season. That data point isn’t ideal but it’s not overly problematic at this level of Brown’s development. Where I see a potential issue is the fastball command. When Brown doesn’t finish he leaves the ball up and gets hit hard. For his career, Brown is allowing 9 and a half hits per 9 innings. FUTURE: The continued development of his changeup and refinement of his command will be Brown’s indicators for future success. If strides can be made in those areas, I view Brown’s ceiling of a mid-rotation starter. DISCLAIMER: It’s important to note that I’m not a scout. I don’t have the training or expertise that they do. I do however actually go to see these guys play live, which is more than you’ll get from many online “Scouting Reports”. I also talk to scouts when I’m there. While scouts reserve their reports for their employer, I can share my thoughts with you, the reader. While you may be correct with your terminal velocity statement, you underestimate the actual top velocity. I personally have seen him throw in bullpens and games at UK 8 plus innings at 94+. Most recently a 10 inning preformance against Arkansas where he gave up only a solo HR in the 10th with 109 pitch recorded. He never dropped velocity under 94 and at times reached a top of 98. I feel that you analysis of Zach Brown is off and as you stated you are not a scout for any MLB team. While everyone is in entitled his or her own opinion, sometimes opinions should be just that and not shared with anyone but yourself. You’re right, perhaps you should keep your opinion to yourself. What I stated regarding Brown’s velo in those starts were cold hard facts. I made no mention of his top velocity. In the two starts in which I saw Brown, he sat 91-93. I wasn’t at the Arkansas start. If I was, we might have something in which we can disagree upon. Boys boys grow up and quit with the harshness. Let’s just see what becomes of the kid because as is was in grade school,junior high and high school nothing we have done in any of those mattered after we got out into the real world!!!!! !